Lasse BJerre in action for Panthers against Rye House. Photo: David Lowndes. Sit down, take a deep breath and await a major revelation . . . Peterborough Panthers have won a home meeting! The city team finally sampled success at the East of England Showground last night (September 12) to keep their Premier League play-offs dream alive. Back to form Panthers skipper Ulrich Ostergaard leads heat five in the meeting with Rye House. Photo: David Lowndes. A 46-43 triumph against rock-bottom Rye House – which was hardly convincing, but hugely important – catapulted Panthers back into fifth place in the standings. The victory, clinched by a 5-1 from recent signing Kenneth Bjerre and back-on-song Ulrich Ostergaard in a heat 15 re-run (after both Rye House riders crashed out of the initial staging), may well prove to be too little, too late in terms of nailing down a play-off spot. But it has at least served to extend the interest in the club’s season for a few more days at least even though, as things stood first thing this morning (September 13), they still had not managed to agree a date for their remaining away fixture at Edinburgh. They’ll need to sort it swiftly with the September 19 cut-off date now looming large on the horizon. Panthers currently sit a point clear of the two sides they leapfrogged last night – Ipswich and Sheffield – with the former occupying the final play-off spot due to possessing a superior points difference compared to the latter. But with Sheffield in action tonight (September 13, at Rye House) and tomorrow (September 14, at home to Scunthorpe) things are likely to change quickly and Ipswich then complete their season with fixtures on Thursday (September 15) and Sunday (September 18) against Newcastle, who are already certain of a play-off spot. What we do already know is that eighth-placed Workington are now out of the running as they sit five points off the top-six and only have one more league meeting scheduled before the cut-off date. “It was do-or-die in the last race, and Kenneth and Ulrich delivered the result we needed,” said Panthers team manager Carl Johnson. “We made life hard for ourselves again, we dropped some silly points again, and we didn’t really back up the top four again, but at least we came out of the meeting with the win. “There is a bit of pressure on the other teams chasing a play-off spot to now pick up the results they need. “If it comes down to it, we still hope we can go to Edinburgh and get a result to get us in the play-offs. “We put together a team we thought would win the league and that’s still the plan even though things haven’t worked out how we expected so far. Perhaps the most satisfying aspect of Panthers’ success last night was seeing Osterrgaard at his best again. 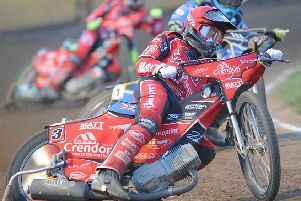 The skipper racked up a paid 13-point haul which included a hat-trick of triumphs and was bettered only by his final heat colleague, Bjerre, who dropped only one point in a heat seven defeat at the hands of Cameron Heeps. But Heeps was then of one the two riders to hit the deck in the closing race, taking avoiding action as partner Stuart Robson lost control in front of him. Yet with Robson excluded, it was actually Heeps who came off worse with suspected muscle damage to his thigh and concussion meaning he could take no part in the re-run. That honour instead went to high-scoring reserve Rob Branford, but he could only watch on from the rear as Bjerre and Ostergaard surged to a vital success. Branford had earlier roared into double-figures by winning three of his four races while also succeeding in irritating the Panthers management with his habit of rolling at the start. Referee Dave Watters also spotted it on one occasion, ahead of heat 12, and slapped on the red lights while issuing a public warning to remain still. Branford ignored such advice, did the same thing again in the rerun, got away with it and inspired the Rockets to a 5-1 that put into a narrow lead for the third time. They preserved that cushion during a shared heat 13 (won by Kenneth Bjerre with his guest brother, Lasse at the rear) and a penultimate contest, in which Anders Thomsen powered to his only win of the night and reserve Zdenek Holub picked up the only point. And Kenneth Bjerre and Ostergaard then completed the turnaround by clinically taking care of business in the finale following a lengthy delay as Heeps was treated by the track paramedic. It was an entertaining clash from start to finish with Panthers being stung by a post-race award of a 5-0 to Rye House following heat two. Holub thought he had earned a dominant victory, but instead he found himself excluded for not having a chain-guard on his bike. And, with partner Danny Halsey having tumbled out earlier in the race, that left Rye House reserve Branford and Ben Morley (who himself fell and remounted to finish) with a 5-0. They soon recovered to lead with a couple of 5-1s from Ostergaard and Thomsen helping massively before three successive advantages from Rye House led to the visitors inching back ahead following heat eight. Then it was Panthers’ turn to shade it again with a couple of 4-2s, then it was Rye House’s turn to respond with that 5-1 in heat 12, but the only thing that mattered in the end was that the city side led at the end of the night. PANTHERS: Kenneth Bjerre 14, Ulrich Ostergaard 12+1, Anders Thomsen 8+2, Lasse Bjerre (guest) 8, Richard Hall 3, Zdenek Holub 1, Danny Halsey 0. RYE HOUSE: Rob Branford 11, Stuart Robson 9, Michael Palm Toft (guest) 6+1, Cameron Heeps (withdrawn) 6+1, Leigh Lanham 5, Kasper Lykke 3+2, Ben Morley 3+2.